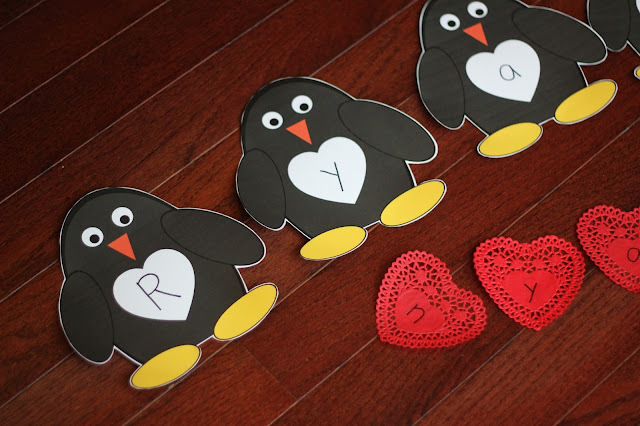 This week we are spotlighting Penguin and the Pinecone by Salina Yoon and we created a penguin name game to go along with the penguin theme! My preschooler has been having so much fun at preschool learning about names, building them, cheering for them, etc. We carried the enthusiasm home and decided to make a little name matching game. 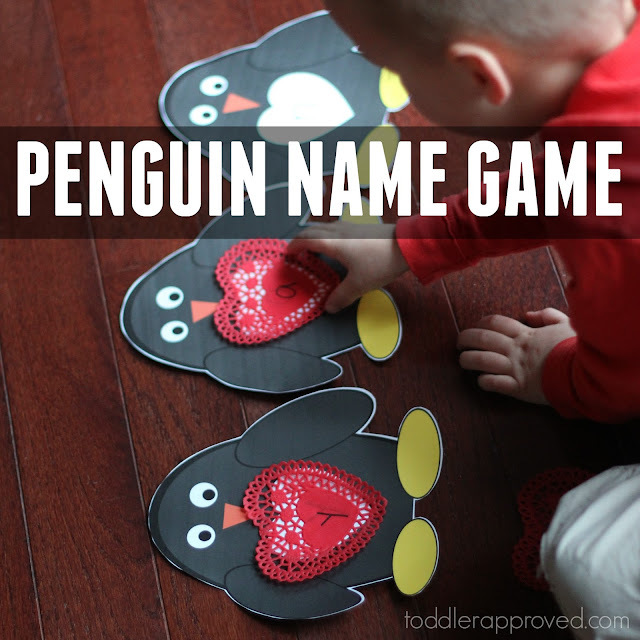 To get started you need to print and cut out a penguin for each letter in your child's name. I was able to cut a few out at a time so this only took a few minutes to prep. Next, write the letters for your child's name on the penguins. Put one on each heart shaped belly. 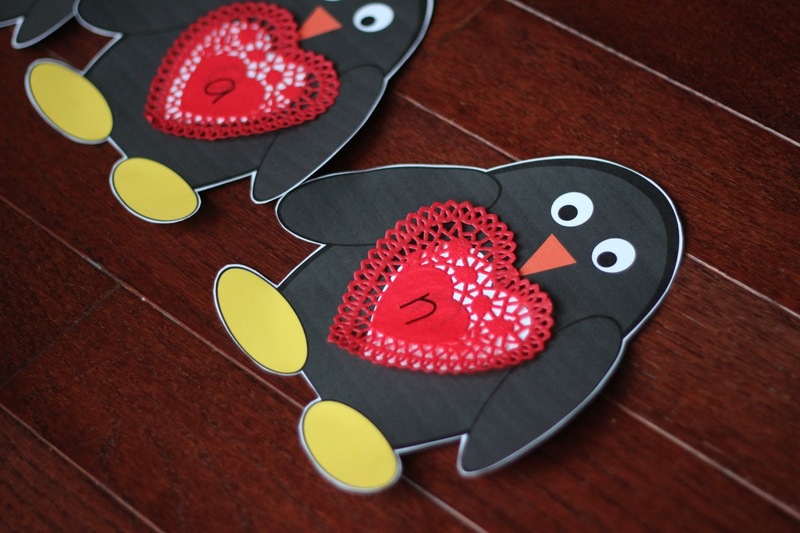 Lastly, write corresponding letters on the heart doilies. Once that is done, you are ready play! Lay out your penguins. You can secure them in place with some tape if you'd like. Next place the heart doilies nearby and mix them up! Have your child try and match the heart doilies to the white heart penguin bellies. 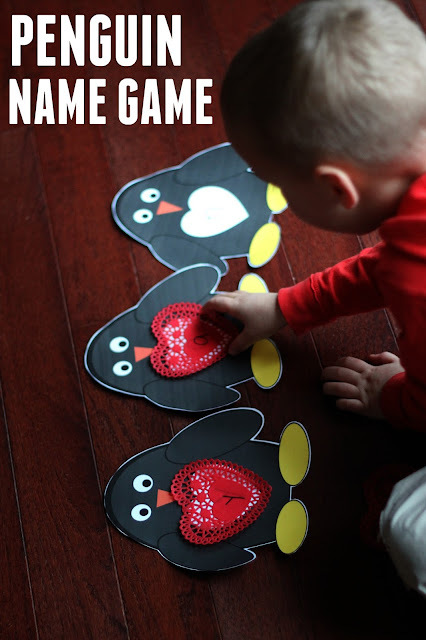 After we matched the hearts we spelled the name we made, said it, cheered it, counted the letters, and talked about other words that started with the same letters as the letters in his name. To make this even more fun, HIDE the heart doilies around your house. Have your child find the heart doilies and then match them to the penguins. I'm warning you now, you may play the hiding game all day. My kids always LOVE it. 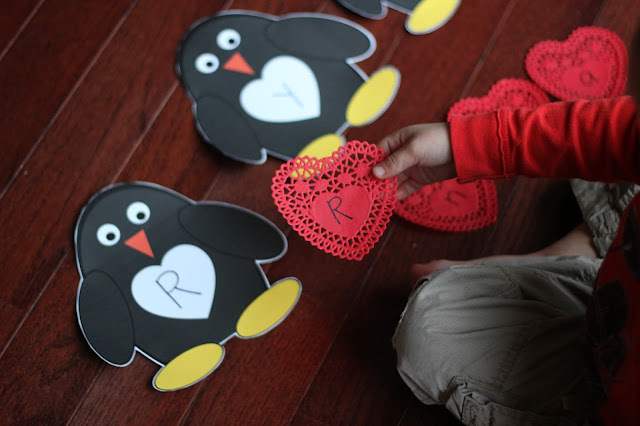 Have another favorite penguin themed activity? Tell me about it!